All steel construction with steel double walls for more strength and greater durability. A clam shell lid construction, which provides better access and visibility to the till. Rear locking mechanism, which runs the height of each unit, locks full-length drawers in at least two locations. Tubular locks provide added security. Recessed handles allow units to be used in work environments where space is tight. 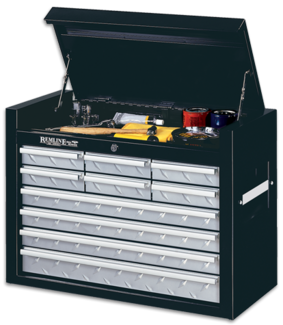 Black powder coat painted body and silver-gray painted tread plate drawers provide a tough, rugged look.